Co najmniej 40 osób, głównie górników, zaginęło po osunięciu się ziemi w prowincji Benguet na filipińskiej wyspie Luzon – poinformowała lokalna policja. Do zdarzenia doszło na skutek tajfunu, który przeszedł nad Filipinami w nocy z piątku na sobotę. Na schron, w którym byli górnicy (około 200 kilometrów na północ od stołecznej Manili) miała osunąć się część góry. W sumie, w całym kraju, przez tropikalny cyklon Mangkhut śmierć na Filipinach poniosło prawdopodobnie już ponad 100 osób. 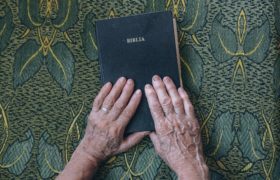 Burmistrz miasta Itogon Victorio Palangdan ocenił, że nie ma większych szans, iż zaginieni górnicy żyją. Zgodnie z informacjami filipińskiego koordynatora ds. 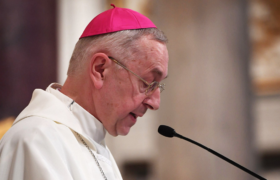 klęsk żywiołowych najwięcej osób zginęło w regionie autonomicznym Cordillera. Większość z nich została pochłonięta przez osuwiska spowodowane ulewami. 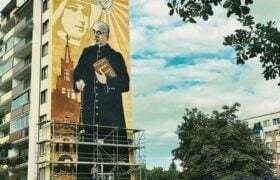 Niektórzy stracili życie w swych domach zniszczonych przez gwałtowne wichury. Na Luzonie żywioł zrywał dachy, zdewastowane zostały uprawy rolne, terminal lotniczy w mieście Tuguegarao został zniszczone. Ulewne deszcze powodują powodzie. 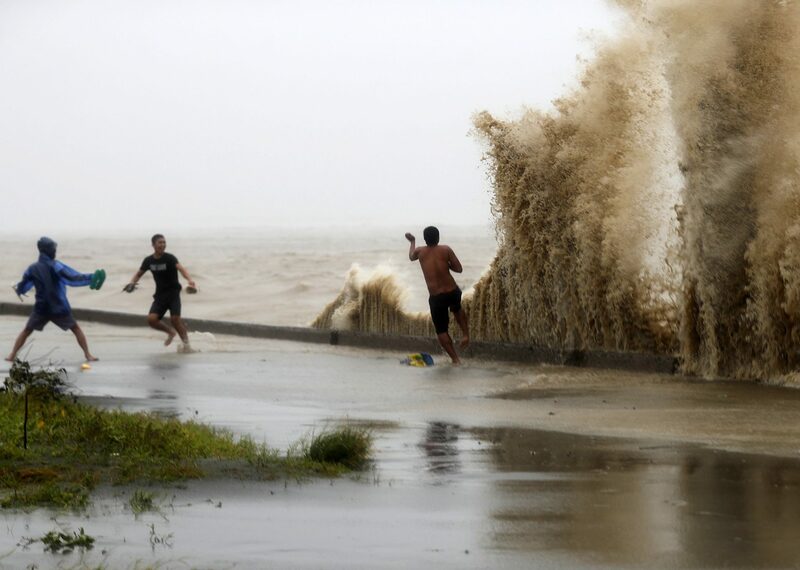 epaselect epa07021337 Filipinos frolic on waves in the typhoon-hit town of Aparri, Cagayan province, Philippines, 15 September 2018. Mangkhut, the most powerful typhoon to strike the Philippines in the last five years, made landfall in the northeastern town of Baggao with maximum sustained winds of 205 km/h (128 mph) and gusts of up to 285 km/h (177 mph). The Category 5 storm came ashore at 1:40 am (17:40 GMT on 14 September) in Cagayan province, the Philippine Atmospheric, Geophysical, and Astronomical Services Administration (PAGASA) said. Mangkhut, denoted Ompong in the Philippines, is moving west-northwest at 35 km/h and is expected to exit the archipelago in the direction of Hong Kong late 15 September, according to the PAGASA bulletin. 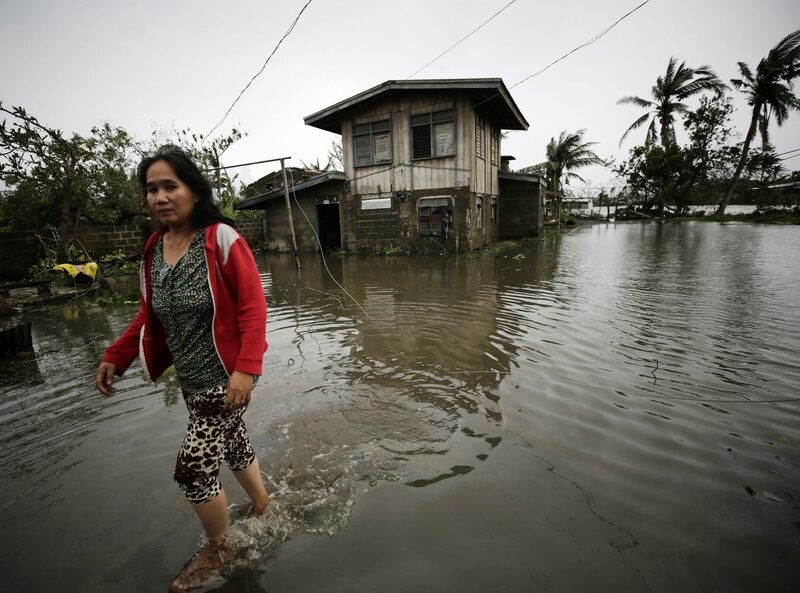 Forecasters said that coastal areas in the impact zone could experience a storm surge of as much as 6 meters. EPA/FRANCIS R. MALASIG Dostawca: PAP/EPA. epaselect epa07021460 A man attempts to recover salvageable materials in Manila Bay, Manila, Philippines, 15 September 2018. Mangkhut, the most powerful typhoon to strike the Philippines in the last five years, made landfall in the northeastern town of Baggao with maximum sustained winds of 205 km/h (128 mph) and gusts of up to 285 km/h (177 mph). The Category 5 storm came ashore at 1:40 am (17:40 GMT on 14 September) in Cagayan province, the Philippine Atmospheric, Geophysical, and Astronomical Services Administration (PAGASA) said. Mangkhut, denoted Ompong in the Philippines, is moving west-northwest at 35 km/h and is expected to exit the archipelago in the direction of Hong Kong late 15 September, according to the PAGASA bulletin. Forecasters said that coastal areas in the impact zone could experience a storm surge of as much as 6 meters. EPA/MARK R. CRISTINO Dostawca: PAP/EPA. 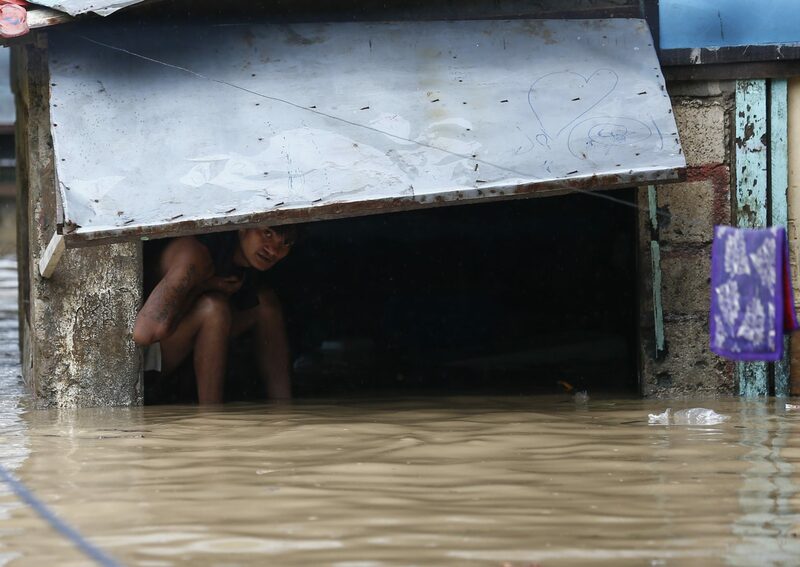 epaselect epa07021609 A resident looks out from his home amidst floodwaters in San Mateo town of Rizal Province, east of Manila, Philippines 15 September 2018 Mangkhut, the most powerful typhoon to strike the Philippines in the last five years, made landfall in the northeastern town of Baggao with maximum sustained winds of 205 km/h (128 mph) and gusts of up to 285 km/h (177 mph). The Category 5 storm came ashore at 1:40 am (17:40 GMT on 14 September) in Cagayan province, the Philippine Atmospheric, Geophysical, and Astronomical Services Administration (PAGASA) said. Mangkhut, denoted Ompong in the Philippines, is moving west-northwest at 35 km/h and is expected to exit the archipelago in the direction of Hong Kong late 15 September, according to the PAGASA bulletin. Forecasters said that coastal areas in the impact zone could experience a storm surge of as much as 6 meters. EPA/ROLEX DELA PENA Dostawca: PAP/EPA. epa07021721 Filipino villagers view what is left of their home in the typhoon-hit town of Baggao, Cagayan province, Philippines, 15 September 2018. 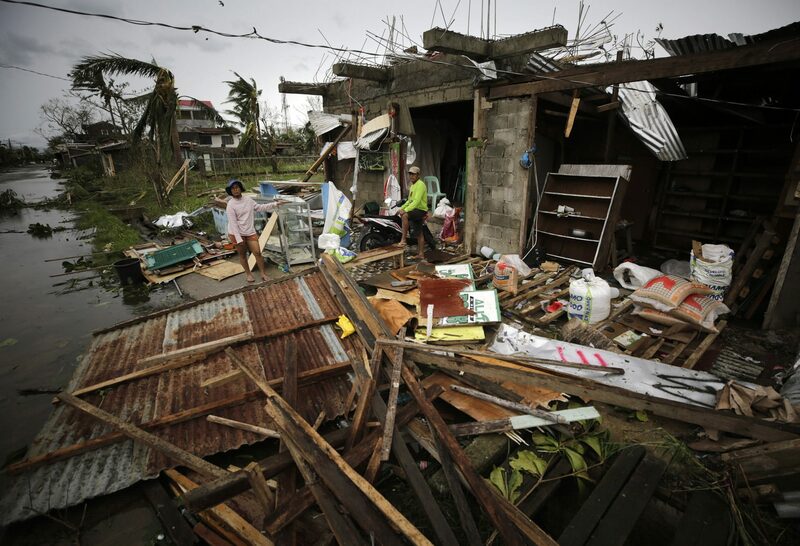 Mangkhut, the most powerful typhoon to hit the Philippines in the last five years, has weakened slightly after its passage through the northern part of the country, with sustained winds of 170 kilometers per hour and gusts of up to 260 kilometers per hour without any reports of casualties so far, authorities said. Over 50,000 people in all regions expected to be struck by the typhoon have been evacuated although over 5.2 million Filipinos living in a 125 kilometer radius from Mangkhut’s trajectory will feel its impact, according to the National Disaster Risk Reduction and Management Council. EPA/FRANCIS R. MALASIG Dostawca: PAP/EPA. 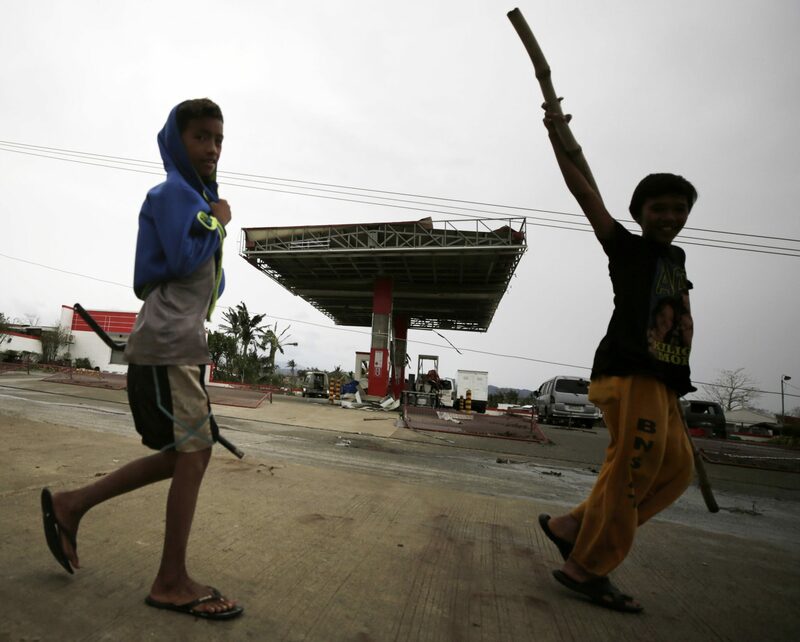 epa07021751 Filipino children walk past a damaged gasoline station in the typhoon-hit town of Baggao, Cagayan province, Philippines, 15 September 2018. 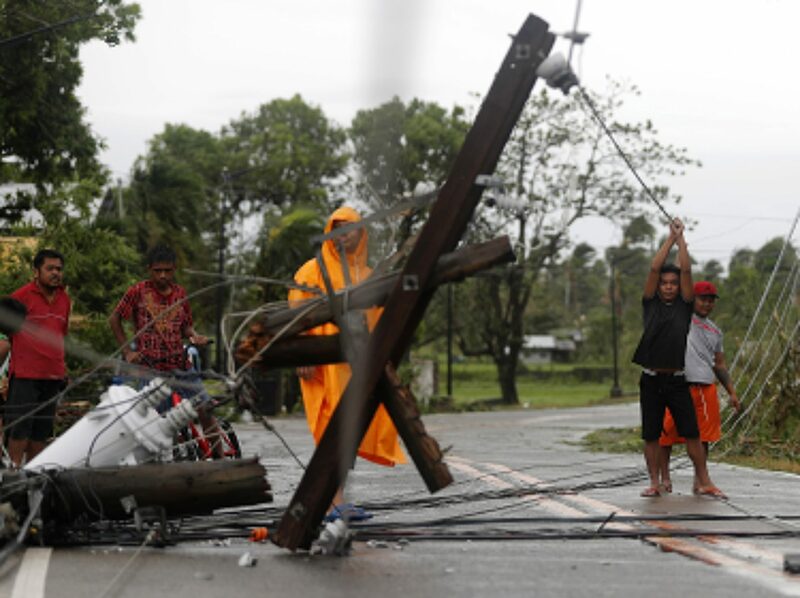 Mangkhut, the most powerful typhoon to hit the Philippines in the last five years, has weakened slightly after its passage through the northern part of the country, with sustained winds of 170 kilometers per hour and gusts of up to 260 kilometers per hour without any reports of casualties so far, authorities said. Over 50,000 people in all regions expected to be struck by the typhoon have been evacuated although over 5.2 million Filipinos living in a 125 kilometer radius from Mangkhut’s trajectory will feel its impact, according to the National Disaster Risk Reduction and Management Council. EPA/FRANCIS R. MALASIG Dostawca: PAP/EPA. 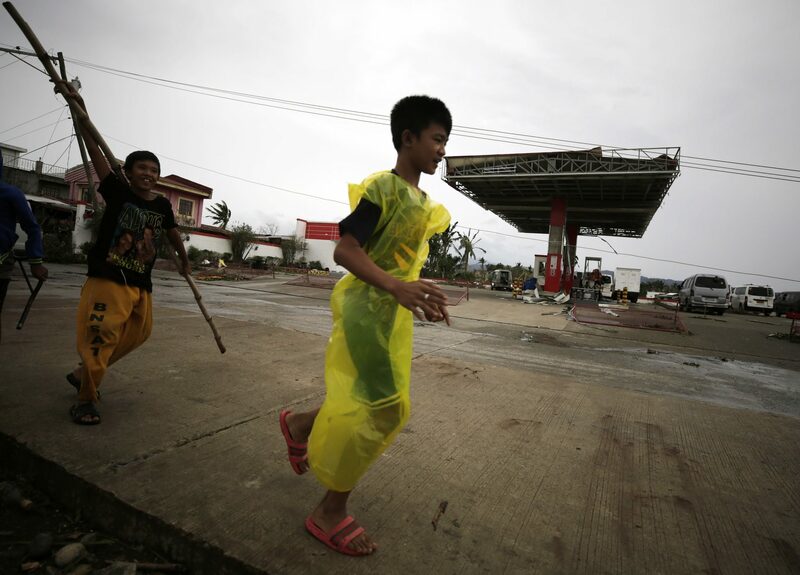 epa07021771 Filipino children walk past a damaged gasoline station in the typhoon-hit town of Baggao, Cagayan province, Philippines, 15 September 2018. Mangkhut, the most powerful typhoon to hit the Philippines in the last five years, has weakened slightly after its passage through the northern part of the country, with sustained winds of 170 kilometers per hour and gusts of up to 260 kilometers per hour without any reports of casualties so far, authorities said. Over 50,000 people in all regions expected to be struck by the typhoon have been evacuated although over 5.2 million Filipinos living in a 125 kilometer radius from Mangkhut’s trajectory will feel its impact, according to the National Disaster Risk Reduction and Management Council. EPA/FRANCIS R. MALASIG Dostawca: PAP/EPA. 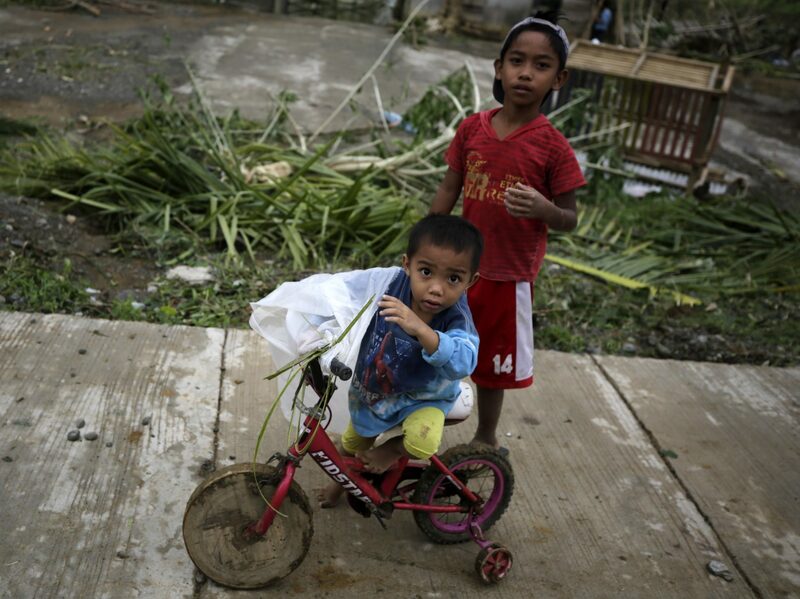 epa07021775 Filipino children maneuver amongst debris in the typhoon-hit town of Baggao, Cagayan province, Philippines, 15 September 2018. Mangkhut, the most powerful typhoon to hit the Philippines in the last five years, has weakened slightly after its passage through the northern part of the country, with sustained winds of 170 kilometers per hour and gusts of up to 260 kilometers per hour without any reports of casualties so far, authorities said. 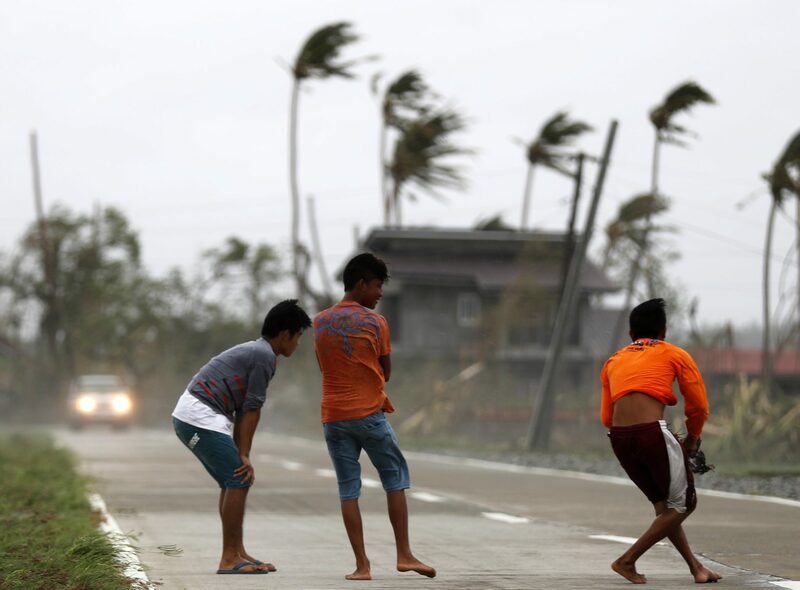 Over 50,000 people in all regions expected to be struck by the typhoon have been evacuated although over 5.2 million Filipinos living in a 125 kilometer radius from Mangkhut’s trajectory will feel its impact, according to the National Disaster Risk Reduction and Management Council. EPA/FRANCIS R. MALASIG Dostawca: PAP/EPA. epa07022417 Fillipino villagers lift electric wires in the typhoon-hit town of Lal-lo, Cagayan province, Philippines, 15 September 2018. 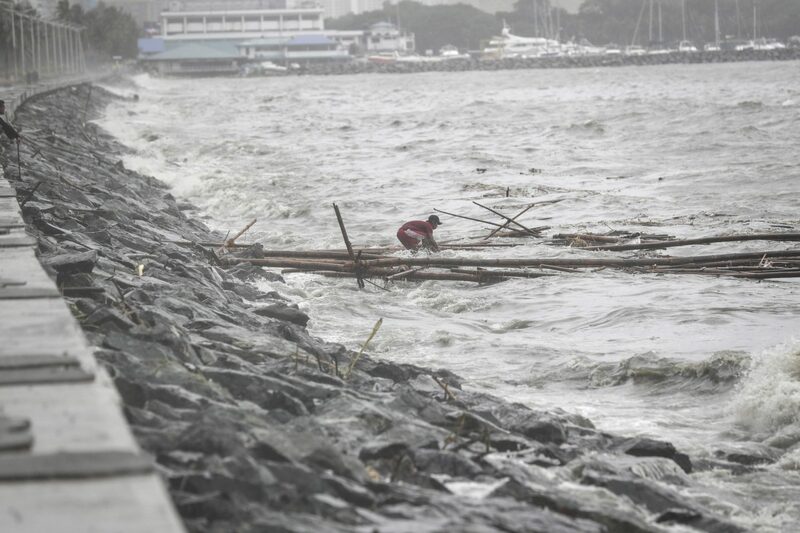 Mangkhut, the most powerful typhoon to hit the Philippines in the last five years, has weakened slightly after its passage through the northern part of the country, with sustained winds of 170 kilometers per hour and gusts of up to 260 kilometers per hour without any reports of casualties so far, authorities said. Over 50,000 people in all regions expected to be struck by the typhoon have been evacuated although over 5.2 million Filipinos living in a 125 kilometer radius from Mangkhut’s trajectory will feel its impact, according to the National Disaster Risk Reduction and Management Council. EPA/FRANCIS R. MALASIG Dostawca: PAP/EPA. 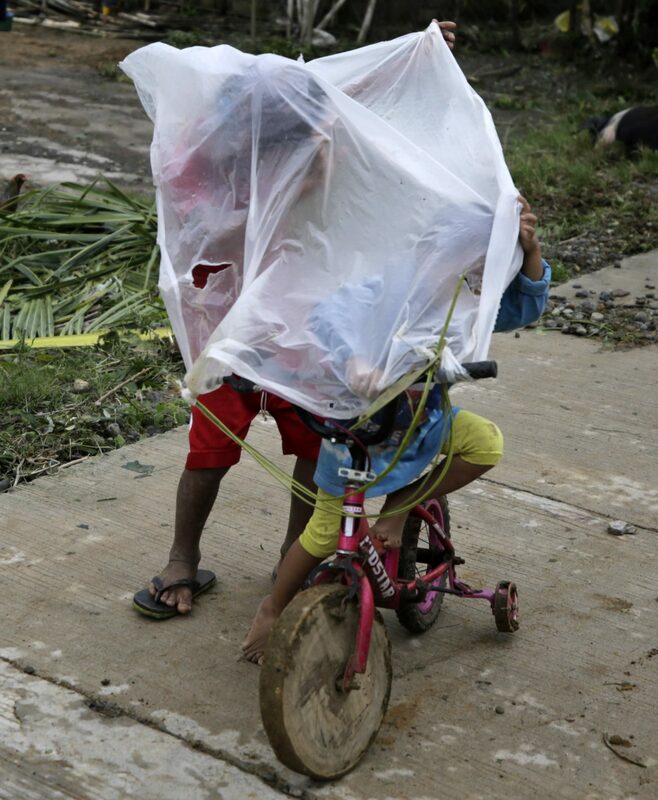 epa07022689 Filipino children cover themselves with a sheet of plastic in the typhoon-hit town of Baggao, Cagayan province, Philippines, 15 September 2018. Mangkhut, the most powerful typhoon to hit the Philippines in the last five years, has weakened slightly after its passage through the northern part of the country, with sustained winds of 170 kilometers per hour and gusts of up to 260 kilometers per hour without any reports of casualties so far, authorities said. Over 50,000 people in all regions expected to be struck by the typhoon have been evacuated although over 5.2 million Filipinos living in a 125 kilometer radius from Mangkhut’s trajectory will feel its impact, according to the National Disaster Risk Reduction and Management Council. EPA/FRANCIS R. MALASIG Dostawca: PAP/EPA. epa07022715 Strong winds batters a villager in the typhoon-hit town of Baggao, Cagayan province, Philippines, 15 September 2018. Mangkhut, the most powerful typhoon to hit the Philippines in the last five years, has weakened slightly after its passage through the northern part of the country, with sustained winds of 170 kilometers per hour and gusts of up to 260 kilometers per hour without any reports of casualties so far, authorities said. Over 50,000 people in all regions expected to be struck by the typhoon have been evacuated although over 5.2 million Filipinos living in a 125 kilometer radius from Mangkhut’s trajectory will feel its impact, according to the National Disaster Risk Reduction and Management Council. EPA/FRANCIS R. MALASIG Dostawca: PAP/EPA. 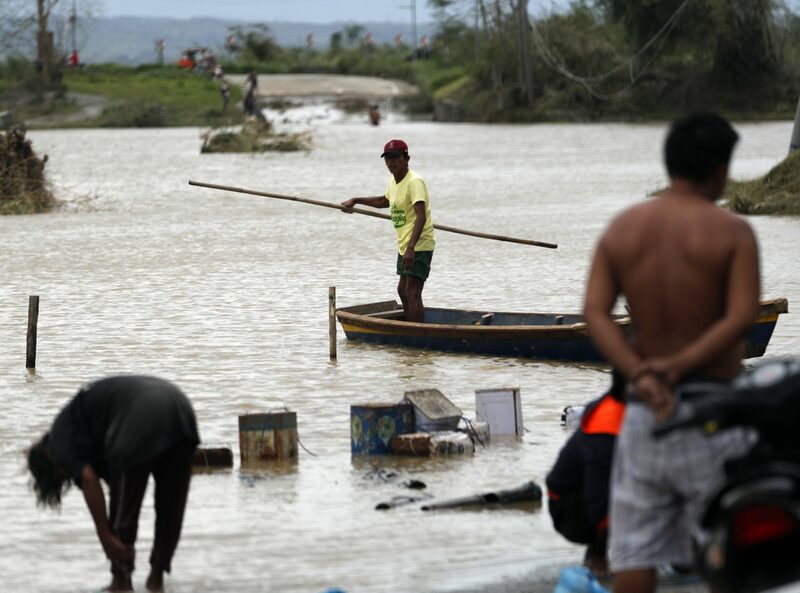 epa07024013 A Filipino villager wades on flood in the typhoon-hit town of Baggao, Cagayan province, Philippines, 15 September 2018 (issued 16 September 2018). 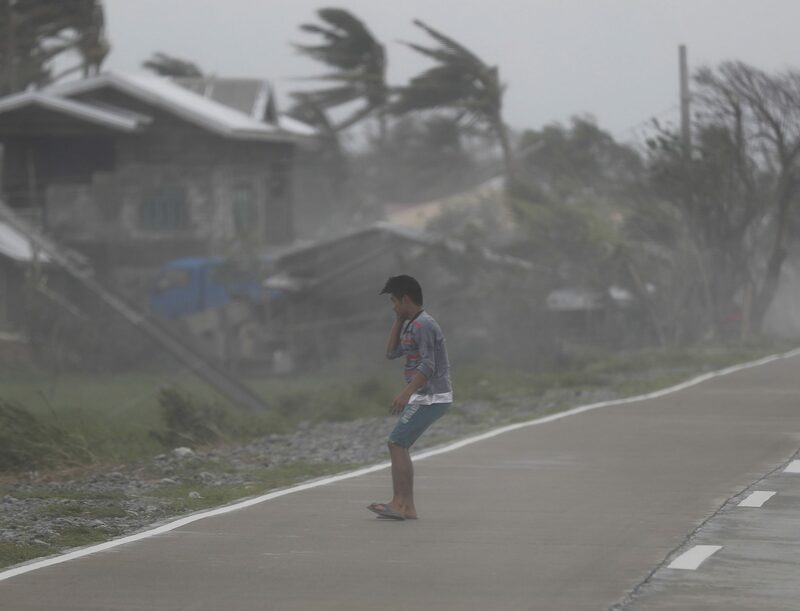 Mangkhut, the most powerful typhoon to hit the Philippines in the last five years, has weakened slightly after its passage through the northern part of the country, with sustained winds of 170 kilometers per hour and gusts of up to 260 kilometers per hour without any reports of casualties so far, authorities said. Over 50,000 people in all regions expected to be struck by the typhoon have been evacuated although over 5.2 million Filipinos living in a 125 kilometer radius from Mangkhut’s trajectory will feel its impact, according to the National Disaster Risk Reduction and Management Council. EPA/FRANCIS R. MALASIG Dostawca: PAP/EPA. 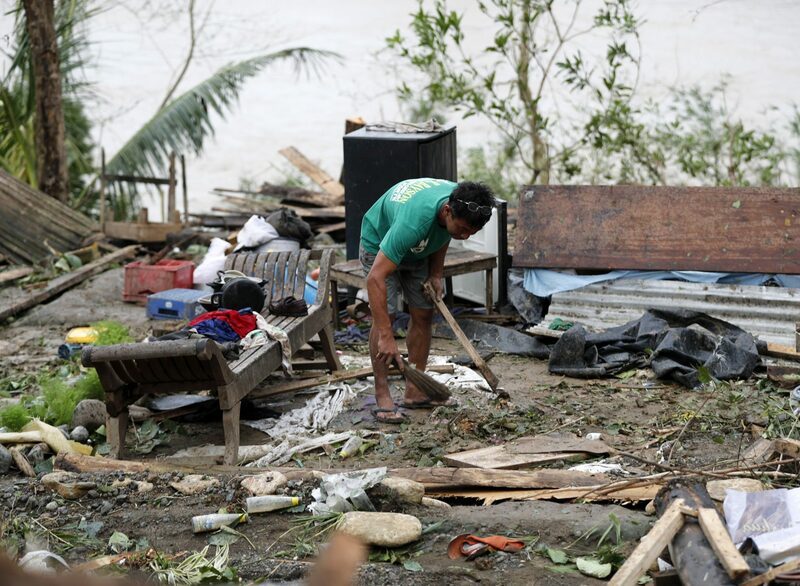 epa07024016 A Filipino villager collects belongings from what is left of his home in the typhoon-hit town of Baggao, Cagayan province, Philippines, 15 September 2018 (issued 16 September 2018). Mangkhut, the most powerful typhoon to hit the Philippines in the last five years, has weakened slightly after its passage through the northern part of the country, with sustained winds of 170 kilometers per hour and gusts of up to 260 kilometers per hour without any reports of casualties so far, authorities said. Over 50,000 people in all regions expected to be struck by the typhoon have been evacuated although over 5.2 million Filipinos living in a 125 kilometer radius from Mangkhut’s trajectory will feel its impact, according to the National Disaster Risk Reduction and Management Council. EPA/FRANCIS R. MALASIG Dostawca: PAP/EPA. epa07024017 Filipino villager children frolic on string winds in the typhoon-hit town of Baggao, Cagayan province, Philippines, 15 September 2018 (issued 16 September 2018). Mangkhut, the most powerful typhoon to hit the Philippines in the last five years, has weakened slightly after its passage through the northern part of the country, with sustained winds of 170 kilometers per hour and gusts of up to 260 kilometers per hour without any reports of casualties so far, authorities said. Over 50,000 people in all regions expected to be struck by the typhoon have been evacuated although over 5.2 million Filipinos living in a 125 kilometer radius from Mangkhut’s trajectory will feel its impact, according to the National Disaster Risk Reduction and Management Council. EPA/FRANCIS R. MALASIG Dostawca: PAP/EPA. epa07024157 Filipinos are seen on a floded street in the typhoon-hit city of Tuguegarao, Cagayan province, Philippines, 16 September 2018. The number of people killed in the Philippines by typhoon Mangkhut rose to 25 while dozens are missing, according to provisional data gathered as emergency teams access areas struck by the storm. EPA/FRANCIS R. MALASIG Dostawca: PAP/EPA. 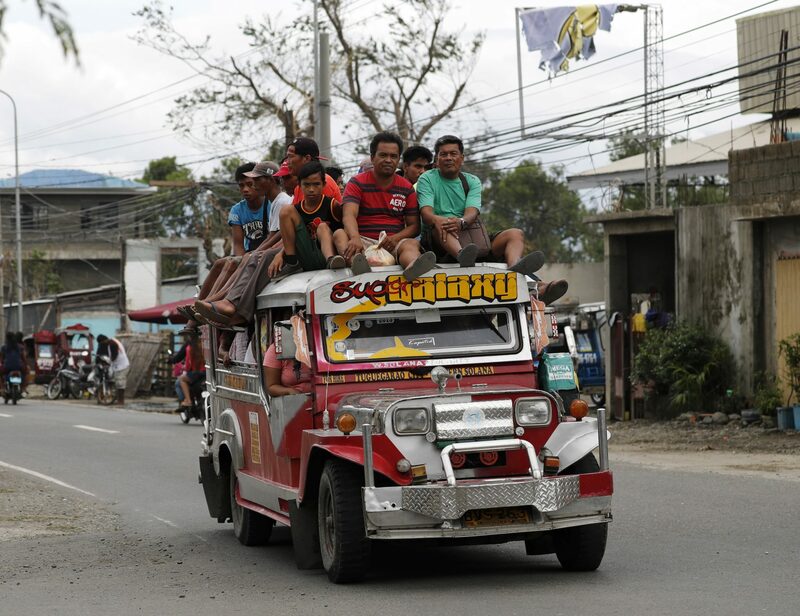 epa07024160 Villagers ride on top of a jeepney, a popular and uniquely Filipino mode of mass transport, in the typhoon-hit city of Tuguegarao, Cagayan province, Philippines, 16 September 2018. The number of people killed in the Philippines by typhoon Mangkhut rose to 25 while dozens are missing, according to provisional data gathered as emergency teams access areas struck by the storm. EPA/FRANCIS R. MALASIG Dostawca: PAP/EPA. 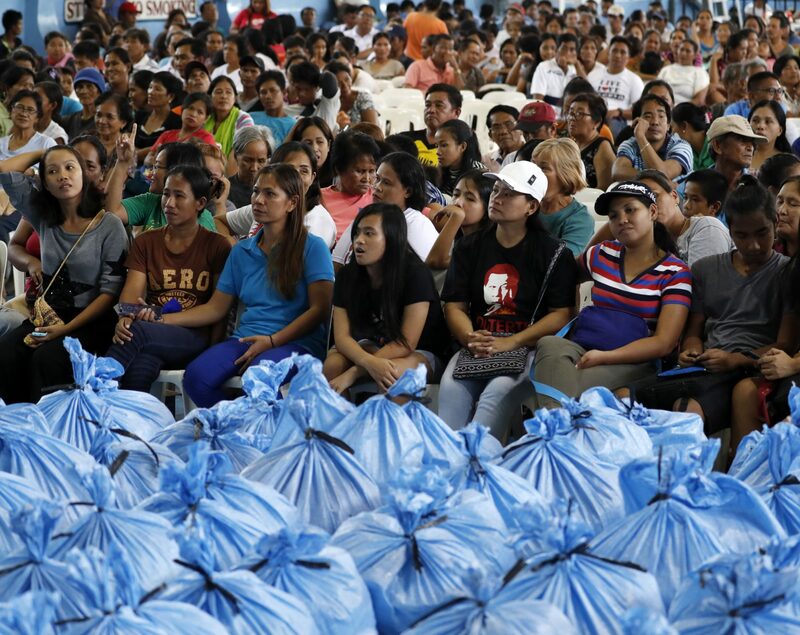 epa07024162 Filipinos wait during a relief distribution in the typhoon-hit city of Tuguegarao, Cagayan province, Philippines, 16 September 2018. The number of people killed in the Philippines by typhoon Mangkhut rose to 25 while dozens are missing, according to provisional data gathered as emergency teams access areas struck by the storm. EPA/FRANCIS R. MALASIG Dostawca: PAP/EPA. 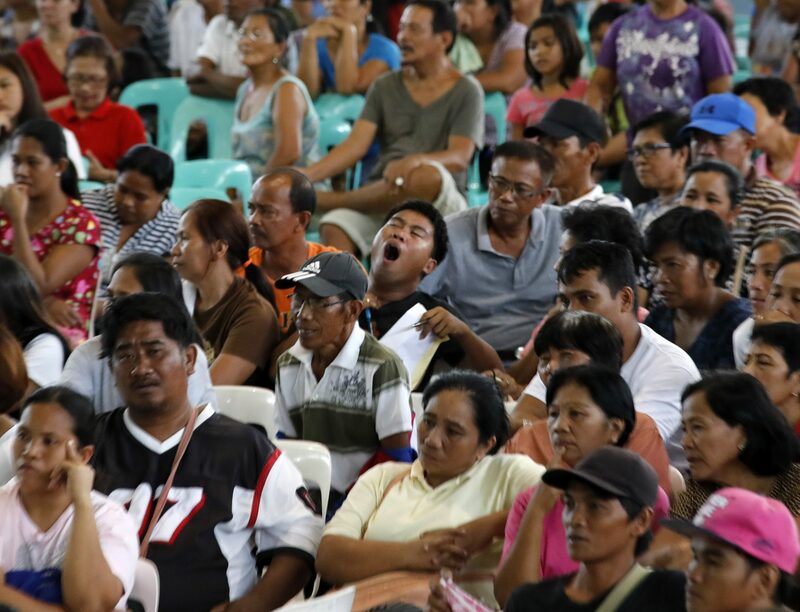 epa07024163 Filipinos wait during a relief distribution in the typhoon-hit city of Tuguegarao, Cagayan province, Philippines, 16 September 2018. The number of people killed in the Philippines by typhoon Mangkhut rose to 25 while dozens are missing, according to provisional data gathered as emergency teams access areas struck by the storm. EPA/FRANCIS R. MALASIG Dostawca: PAP/EPA. 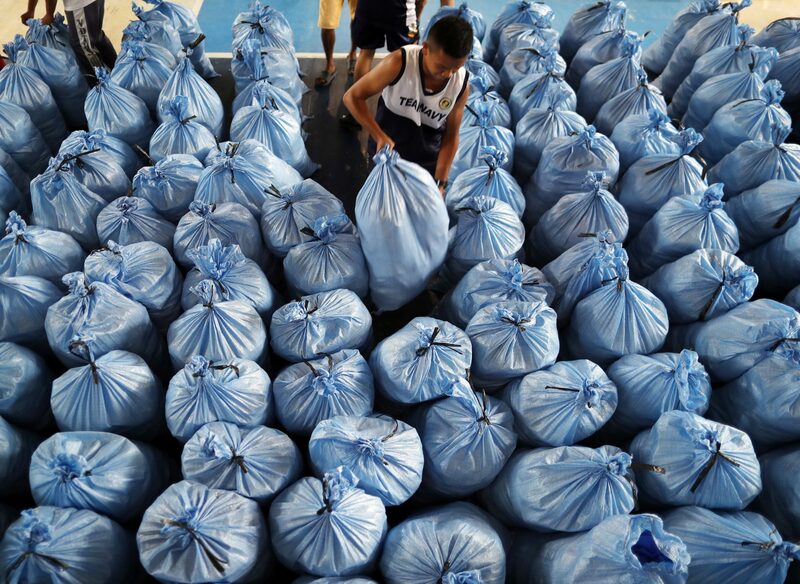 epaselect epa07024177 A Filipino navy personnel carries a sack of relief goods in the typhoon-hit city of Tuguegarao, Cagayan province, Philippines, 16 September 2018. The number of people killed in the Philippines by typhoon Mangkhut rose to 25 while dozens are missing, according to provisional data gathered as emergency teams access areas struck by the storm. EPA/FRANCIS R. MALASIG Dostawca: PAP/EPA. 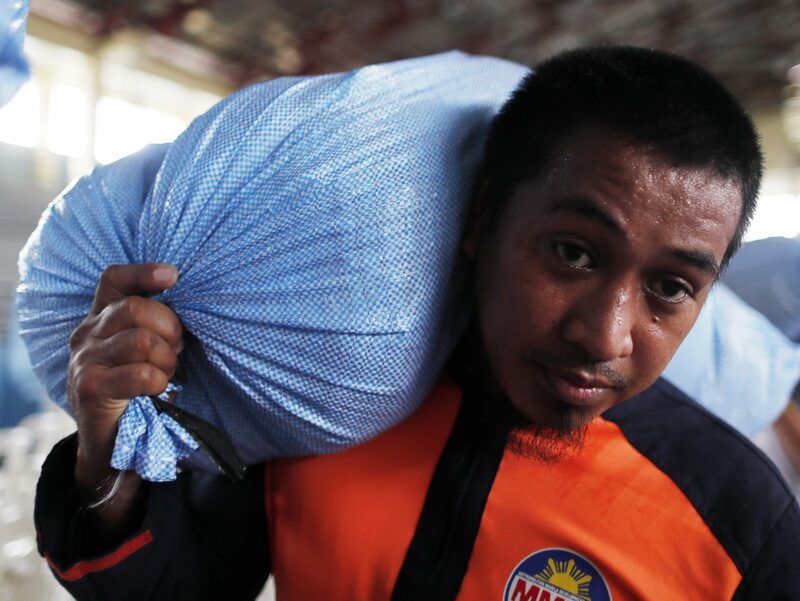 epa07024178 A Filipino government worker carries a sack of relief goods in the typhoon-hit city of Tuguegarao, Cagayan province, Philippines, 16 September 2018. The number of people killed in the Philippines by typhoon Mangkhut rose to 25 while dozens are missing, according to provisional data gathered as emergency teams access areas struck by the storm. EPA/FRANCIS R. MALASIG Dostawca: PAP/EPA. 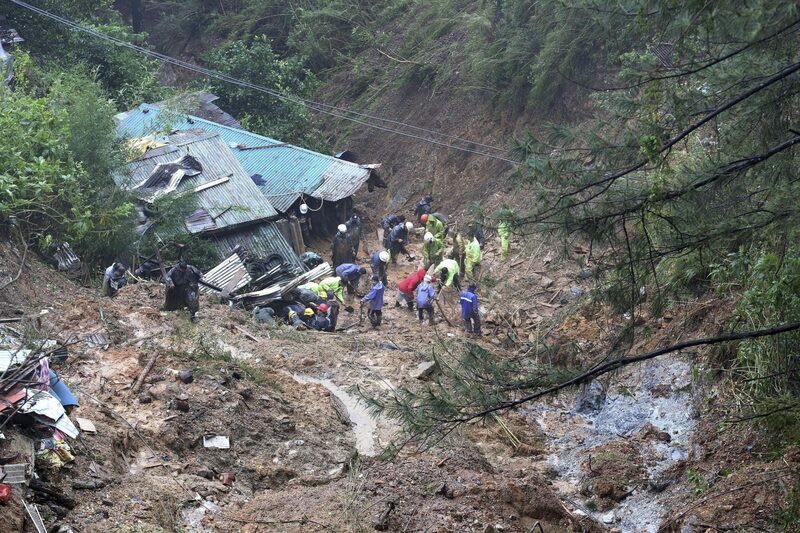 epaselect epa07024250 Rescuers and paramedics and volunteers conduct search and retrieval operation to locate the three missing persons who were buried due to landslide caused by typhoon Mangkhut at Balacbac, Baguio City, north of Manila, Philippines 16 September 2018. The number of people killed in the Philippines by typhoon Mangkhut rose to 25 while dozens are missing, according to provisional data gathered as emergency teams access areas struck by the storm. EPA/STR Dostawca: PAP/EPA. 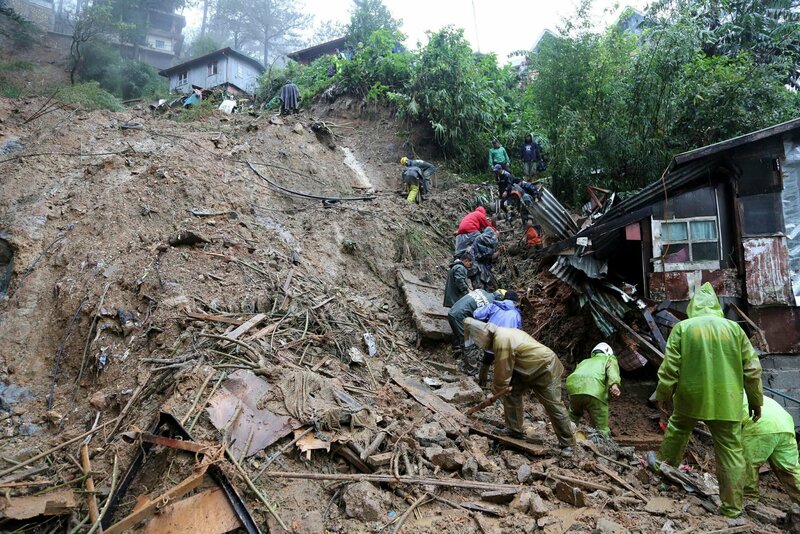 epaselect epa07024251 Rescuers, paramedics and volunteers conduct search and retrieval operation to locate the three missing persons who were buried due to a landslide caused by typhoon Mangkhut at Balacbac, Baguio City, North of Manila, Philippines, 16 September 2018. The number of people killed in the Philippines by typhoon Mangkhut rose to 25 while dozens are missing, according to provisional data gathered as emergency teams access areas struck by the storm. EPA/STR Dostawca: PAP/EPA. 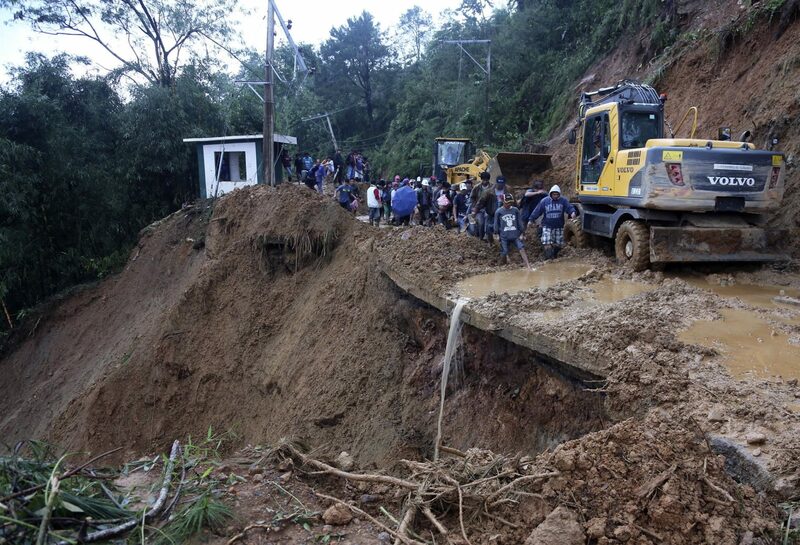 epa07024253 Rescuers, paramedics and volunteers conduct search and retrieval operation to locate the three missing persons who were buried due to a landslide caused by typhoon Mangkhut at Balacbac, Baguio City, North of Manila, Philippines, 16 September 2018. The number of people killed in the Philippines by typhoon Mangkhut rose to 25 while dozens are missing, according to provisional data gathered as emergency teams access areas struck by the storm. EPA/STR Dostawca: PAP/EPA. 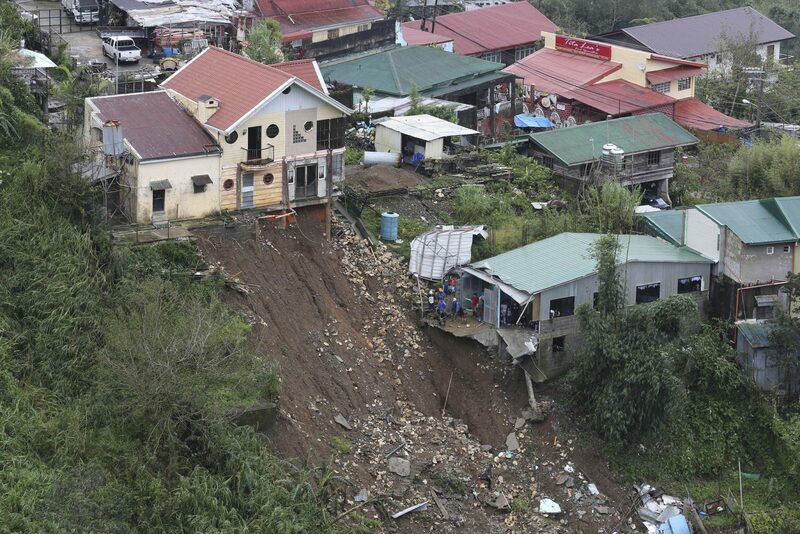 epa07024881 Residents going across a road damaged by typhoon Mangkhut in Itogon, Benguet province, north of Manila, Philippines, 16 September 2018. The number of people killed in the Philippines by typhoon Mangkhut rose to 25 while dozens are missing, according to provisional data gathered as emergency teams access areas struck by the storm. EPA/STR Dostawca: PAP/EPA. 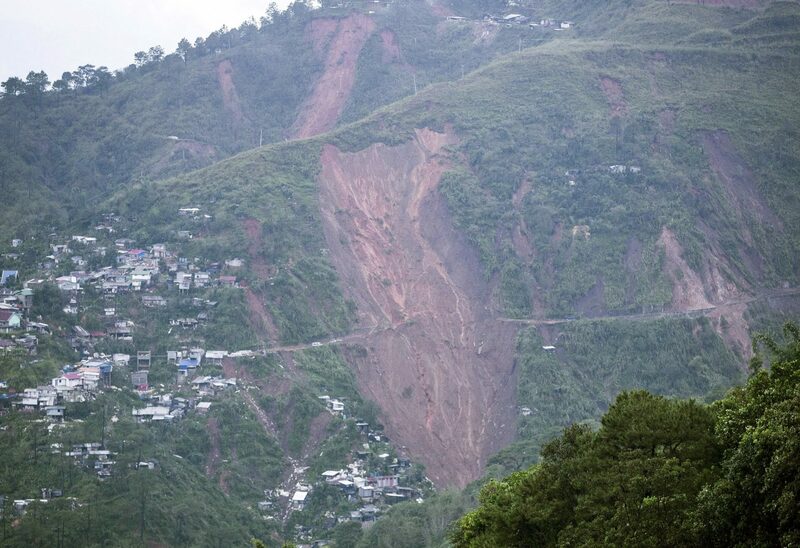 epa07024882 A general view on a landslide area that was caused by typhoon Mangkhut in Itogon, Benguet province, north of Manila, Philippines 16 September 2018. The number of people killed in the Philippines by typhoon Mangkhut rose to 25 while dozens are missing, according to provisional data gathered as emergency teams access areas struck by the storm. EPA/STR Dostawca: PAP/EPA.